The AP, AFP, Reuters, HuffPost, and everyone else in the mainstream media have had a field day with the Artemis crash; it has all the elements they love: Powerful imagery, Olympic medals, Rich guys getting brought down to Earth, and the death of a beloved icon with a great nickname. But more than all of that, it seems those ‘journalists’ really just love saying “Zone of Death” or “Death Zone” in an article, regardless of their total lack of understanding of what the term means. For those of you who’ve never sailed true high-performance boats, here’s an explanation of the term from IshmaelHatesThatDamnWhale, and you can jump in the thread yourself with questions or to add something, and you can check this slideshow for the best pics we’ve seen of the damaged boat thus far. Following the Artemis AC72 capsize there has been a lot of talk about the “Death Zone” or “Zone of Death” by a lot of people who don’t seem to have a clue what it’s all about. The death zone is the transition during the bear away from going upwind to downwind on an ultra-high performance boat like a beach cat, skiff, or AC72. The reason this is known as the death zone is because when a really fast boat bears away, the apparent wind speed increases a huge amount, putting a large load on the sails and foils as the boat accelerates like a mofo. The sail plan also tries to push the bow down during the bear away, hence the reason why skiffs and multis tend to pitch pole during the bear away. The key to a good bear away is getting through the death zone as quickly as possible, but the driver and trimmers need to be on the same page. It’s not like a keel boat or even a dinghy where you just ease the sheets and turn. 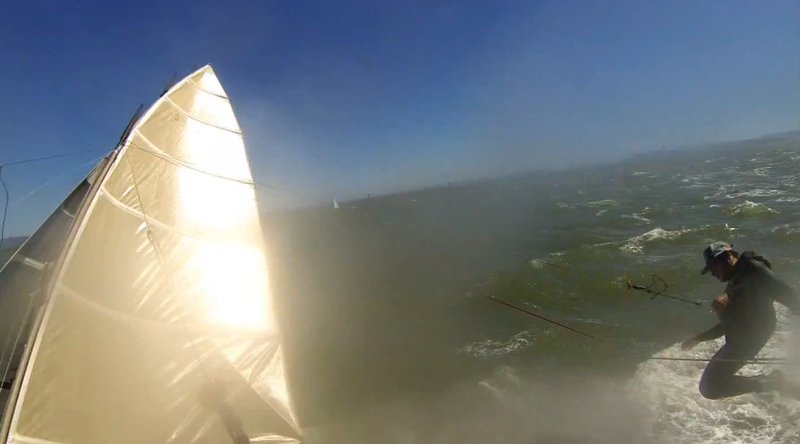 The death zone is also very hard (nearly impossible) to sail in on a skiff. They do not like to jib reach, plain and simple. You either get to go upwind or downwind, otherwise there is too much apparent windspeed and not enough stability (mostly speaking from Aussie 18s), ending in either a pitch pole or digging a rack and cartwheeling. Long story short, anyone who thinks that a bear away in 25 knots on a high performance boat should be as simple as just turning doesn’t have a clue. Below is a quick video from my friends on a 1994 Grand Prix Aussie 18 failing at a bear away; click the photo or this link to play it. That particular boat is a major PITA to sail because it has massive racks and “rack runners” to support them. You can see the mainsail hitting the runners, which helped seal their fate. With all this said, I’m going to go sail an 18 today in honor of a great sailor who lost his life on the cutting edge of this sport.